Rose hips are produced by rose plants once blossoms fall off. You’ve likely seen rose hips in vitamin C formulations, as they are considered a great source of this nutrient. In fact, they’ve got 20 times as much vitamin C as oranges if you compare the fruits ounce per ounce, according to “The Essential Herb-Drug-Vitamin Interaction Guide,” by George Grossberg and Barry Fox. 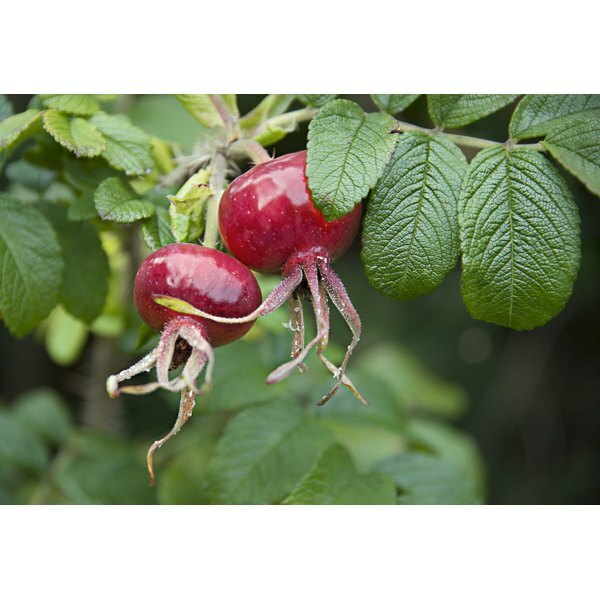 You may also see rose hips used to treat colds or arthritis, and they can produce a few side effects. Speak with a health care provider before adding rose hips to your regimen. Issues such as vomiting, nausea and diarrhea are common side effects you may experience with rose hips, according to Grossberg and Fox. You may experience an allergic reaction to rose hips. Some people exposed to rose hips dust have had severe respiratory reactions, according to Drugs.com. Rose hips belong to the rosaceae family of plants. If you are diabetic it’s best to take rose hips under a health care provider’s supervision because they can interfere with blood sugar control, according to Grossberg and Fox. Rose hips also can raise risk for formation of kidney stones, and can aggravate thalassemia, hemochromatosis and other ailments that worsen with increased iron absorption. Several drugs can interact with rose hips. If you take fluphenazine, be aware that rose hips can reduce blood levels of this drug. Rose hips also can reduce effectiveness of warfarin. Be especially careful if you take ferrous sulfate because rose hips can increase iron absorption, warn Grossberg and Fox.